Charlotte, a guest to Diana's Desserts website, is from Costa Rica, Central America. She offers this recipe as being the "Original" Tres Leches that is made in her country. 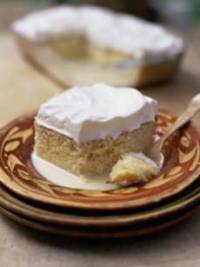 She also says, "The Tres Leches is very rich and delicious and improves with time...a few days after made, it is even better, and she goes on to say: "Never remove cake from baking dish. It is served right from the baking dish or pan". Charlotte also tells me that the Whipped Cream Topping is more popular in Costa Rica than the Meringue Topping. Recipes for both toppings are included below. Preheat oven to 350ºF (180ºC). Grease and lightly flour a 9x13 inch rectangular baking dish (pyrex glass baking dish is good). Set aside. Beat the 6 egg whites until soft peaks form. Add the sugar and self-raising flour, the 6 egg yolks and the ice water. Pour batter into prepared pan, and bake in oven at 350ºF (180ºC) for 25-30 minutes, or until a toothpick inserted in center of cake comes out clean. (Make the Tres Leches Syrup while cake is baking). Remove cake from oven and place cake (Do NOT remove cake from baking dish) on wire cooling rack. In a large bowl combine the evaporated milk, sweetened condensed milk and the 2 cups whole milk. Mix well. Stir in a little rum if desired. With a fork, toothpick or wooden skewer, poke holes all over top of cake and pour the Tres Leches syrup over the top of cake until completely absorbed. Once cake has cooled sufficiently, refrigerate cake in baking dish for at least 3 hours or preferably overnight before frosting with whipped cream or meringue topping. Makes 9 - 12 servings. Before making the Whipped Cream Topping, chill your beaters and bowl in freezer for 15 - 20 minutes. Make sure your heavy whipping cream is well chilled. Pour "chilled" heavy whipping cream into mixing bowl, beat until soft peaks form; add sugar and the vanilla extract and beat until stiff peaks form. Do not overbeat! Spread whipped cream topping evenly over Tres Leches Cake and garnish cake with nuts, fruit or decoration of your choice. Makes approximately 4 cups whipped cream topping. Once the cake is completely chilled, in a saucepan combine the water and sugar. Bring to a boil. Reduce the heat and stir to dissolve the sugar. Cook until the mixture reaches the soft ball stage, 235-240 degrees F (112-115 C) on a candy thermometer. Remove from the heat. In a medium bowl, beat the egg whites until soft peaks form; add lemon juice (optional). While beating, add the hot syrup in a stream. Beat until all the syrup has been added, the mixture cools, and a glossy icing forms. Spread the Meringue Topping evenly across the top of chilled cake. Decorate with nuts, fresh fruit or decoration of your choice. If desired, garnish with mint sprigs or edible flowers. Makes about 4 cups meringue topping. Depending on what country you live in, Evaporated Milk and Sweetened Condensed Milk come in different size cans. Charlotte suggests using 12 ounces of each of these milks plus 2 cups of whole milk for the Tres Leches Syrup. Here in the United States, Sweetened Condensed Milk comes in a 14 ounce can, and Evaporated Milk comes in a 12 ounce can. I used 1 can of each, and this worked well. It is a little more than what the recipe calls for, but that didn't seem to make much difference. I LOVE THAT KIND OF CAKE! This is the BEST recipe ever!!!! I make it every year and is always a HIT!!! Gracias. Muy rica, es buena en cualquier ocasion. This is just a fabulous recipe, very easy to make and the sponge is SO light. I made it for Christmas (2006) and everyone just wanted more - you must make it, Charlotte is a genius. I've put off making this cake until today and all I have to say is the flavor was ok but when the recipe called for you to put holes in the cake and and pour the syrup on to the cake that made the cake soggy and it tasted more like egg bread. Totally not what I expected. The most delicious cake I have made! I made this recipe for my husband and he liked it better than his sister's, who has her own bakery. (OMG!) I substituted Rompope in place of the rum. I got the recipe from my friends mom and is the best dessert I've ever made. Everyone is always asking me to make it for them. I love it. This cake was so delicious and the texture reminded me of Tiramisu. I loved it, and next time I will try the meringue topping! Awesome! I brought this to my South American friends and they were amazed..Before putting the cream on top, I just put a layer of dulce de leche and I topped it with cream and bananas..it was soo YUM! It melts in your mouth, we added hazelnut coffee cream. Yummy, everyone loves it. Best cake. Everyone that has tried it, loves it! I have people asking me to make it for them all the time. THIS IS THE BEST CAKE IN THE WORLD!! i HAVE MADE IT SEVERAL TIMES, AS WELL AS SERVED IT AT A BRIDAL SHOWER...MUCH BETTER THAN DRIED UP BAKERY CAKE!! This is an excellent cake. This is my favorite type of cake. Try it. If you put peach, strawberries, or any friut you like on top or in the middle it tastes great. This is the best cake ever!! Everyone I know that has tried it, loved it. I am 65 and was looking for something different to make. Bravo, what a cake. Children and adults all liked it. Make it, you will love it. I love this cake and it is the cake of mexico. Can anyone tell me how to make the whipped cream stiff to make roses or to decorate with? This has to be the best cake in all of the Americas! Make it. You will love it! This is an awesome cake. Easy to prepare and people always LOVE it! The first time I used this recipe I made two cakes (at the same time). For the first cake I took my time incorporating the ingredients. I'd whip a bit, add a little flour, whip some more, add some more, etc., same with the rest of the ingredients. By the time I got to the second cake I threw the ingredients in a lot quicker. The difference? The first cake came out fluffier, nice and high. The second one came out a bit deflated. They were both good, but I noticed that the second cake, because it was a bit deflated, did not soak up the syrup mixture as well as the first cake. Every single time I've made this cake people rave about the cake and/or have asked me for the recipe. Bottom line: Great flavor, good texture, simple to make. What more could you ask for? I baked this cake using half the recipe. I substituted evaporated milk with cream since it wasn't available. It tasted quite nice. While making the sponge, I beat the yolks with the sugar and added some vanilla, then folded in the water, then the flour and lastly the beaten egg whites. ***Add a tsp of cinnamon, trust me, it makes it unbelievable!!!" I haven't tried this particular recipe but I have tried two other ones, one from scratch and one using a classic white cake mix. Both were great. It's just a great idea for a dessert. But please add cinnamon it makes the sweetness of the cake less cloying and gives it depth of flavor. I PROMISE!!!! Having never heard of this kind of cake before, I was intrigued. And although it turned out relatively well (I couldn't get some of the lumps out of the batter; I reduced the sugar by 1/4 cup, which was a smart move), none of the people I served it to were overly impressed. All felt it was too heavy, meaning after they ate it, they felt too full. My father called it graveyard cake (in reference to graveyard stew)! Absolutely DELICIOUS!!!! I add a tsp of cinnamon to the milk mixture. I agree with the above recommendation (thank you: ) It adds depth of flavor. I also top it with fresh sweetened whipped cream that I flavor with vanilla and rum extract and fresh fruit (strawberrys, bananans and kiwi). Heavenly!!! It's one of my most requested recipes. This is the best recipe ever! I did in a trifle version with fresh fruits and whipped cream and it was excellent! The recipe is travelling to West Africa now! cake is bangin! tres leche here i come! this is authentic costa rican tres leches. easy to make and riquisimo. This cake is wonderfully delicious. Its TOO sweet. After i cut out the amount of sugar and it is still very sweet. And i did not have any rich 'milky' taste like i expected . I am not a cook nor a baker, but I dared myself to make this and guess what! perfection was achieved...now I've made it on a few different special occasions and this recipe never fails to get the compliments at any event!Thanks! I love this cake!! I live in Costa Rica and it is awesome!! To the people that said it was soggy, or not rich enough... Have you ever had Tres Leches before? Did you put in all the condensed milk? Delicious! This is my favorite dessert, thanks for sharing this recipe. I LOVE Tres Leches Cake!! My family and I eat it all the time at birthday parties. This is a great recipe and thank you for the recipe. I will definetely come to you for more recipes.! Amazing. I made this recipe twice and both times everyone absolutely loved it. Cinnamon adds some flavor making this my favorite cake. A tip that really helps is to make sure there are some air bubbles they make it lighter and not as heavy. Just made my first one. We tried this in Costa Rica and loved it! Store bought ones aren't the same so I wanted to try this recipe and it's exactly like Costa Rica version! Thanks! OMG this cake is delish!!!!!! This a cake you cannot pass up, but do you know how to make the clear syrup that is put on the fruits?